Stop, Watch and Go on « CONSTABLE RESEARCH B.V. I am re-reading The Gurdjieff Work of Kathleen Speeth. 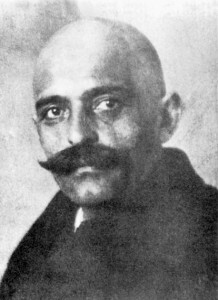 Gurdjieff was a Greek-Arminian mystic and a spiritual teacher that lived between 1872 and 1949. He combined the teachings of the Esoteric Christian tradition of the Essenes, The Naqshbandi Sufi Order and Tibetan Buddhism. His most famous statement is that most people live in a state of “waking sleep“. He has defined a system to get fully awake.One of his exercises is the Stop Exercise. The Stop Exercise is very simple. Somebody calls “Stop” and you stop immediately. The Stop Exercise shows the pattern you are in. The Stop Exercise can be applied to many area’s. Don’t go to work and see if things go on the way they did. If nothing changes don’t go back because you are just not needed. Find something else where a Stop matters. The Stop Exercise can be compared with what is know in Signal Theory as the Delta Pulse. The Delta Pulse is an Event that occurs in a very short time with a very high intensity. A good example is the use of Explosives to find out what is inside the Earth (Oil, Gas, ). It is shown that a Delta Pulse shows the Essence of a System and the Essence of the Human System was exactly what Gurdjieff wanted accomplish. Many people think that The Essence of a human being is perfection but it is sadly the opposite. Perfection is a part of the personality. It wants to stay tuned to its environment. The Essence is just “What it is” and “What it is” can be very annoying to people that are striving for perfection. Essential People can be very brute. In the The Law of Seven Gurdjieff explains processes. It states that ups and downs in life and relationships occur lawfully. At certain steps (every 3) schocks (or stops) occur. If nobody does anything the process simply stops. To move on people have to invest time and motiviation to remove the hurdel. A very high hurdel is the 7th step. The System has gone full cycle and has the ability to jump to higher level or the System breaks down. The Seven Years Itch is shown in all types of relationships (marriage, company,..). It is the final test for endurance. What can we learn: It is wise to stop for a while and see what happens. If everything goes on don’t go back. If a process stops it is wise to find out if it is 3th step. If so put all your efforts in removing the hurdle and things will go on for three steps. This entry was posted on Saturday, May 26th, 2007 at 3:17 pm	and is filed under Completed, Psychology. You can follow any responses to this entry through the RSS 2.0 feed. You can leave a response, or trackback from your own site.